I have no hesitation in affirming the simple statement ‘I love Pierce Turner’. In another existence, another sexual orientation and, probably, another temporal dimension my life would have been surely fulfilled by giving birth to a multitude of Pierce’s children. 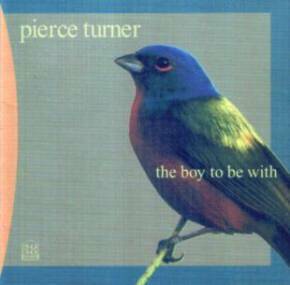 Instead I remain firmly grounded in the belief that Pierce is one of the most devastatingly innovative, constructively creative and ridiculously overlooked songwriters and musicians of the last few decades. It’s not just the world-weary, somewhat ever-knowing voice nor the way he’s intuitively combined his background in the Wexford choral school and love of the sean-nós tradition into a unique and coherent whole which inspires my devotion to all things Pierce, but the way the man has remained an utterly unique figure in Ireland’s music since he first recorded with Larry Kirwan as The Major Thinkers back in the 1980s. You probably know Pierce from his appearance on Bringing It All Back Home on which his All Messed Up matched his own inspired lyrics to the setting of Seán Ó Duibhir an Ghleanna. If not that, then maybe you’ll have heard Christy Moore’s rendition of Pierce’s song Among the Wicklow Hills on the Kildare man’s Ride On album – and, if you have Christy’s The Box Set you’ll also be aware of a track entitled I Love the Way Pierce Turner Sings. Hmm, maybe Christy and I should meet up to form the Pierce Turner Appreciation Society, because someone seriously needs to waggle some fingers at Ireland’s music press and demand to know why Turner receives less attention than a dog show at the RDS. By the way, I should have mentioned the fact, but this isn’t a traditional music album, but Pierce’s heavily rock-oriented, occasionally jazz-inspired and always sideways-facing take on music. As ever, his songs and their titles come straight to the point (Jazz, This Planet, This Life, So Many People), but also include the only rock song possibly ever written about a village in County Leitrim (Drumsna). There’s also chilling self-analysis in You’ve Got Her London (though the reference to Chelsea losing unfortunately dates the album!) and a heart-felt tribute to the best blues guitarist ever to emerge from Ireland, The Ballad of Rory Gallagher. Whatever the case, The Boy to Be With truly captures the spirit and soul of Pierce Turner, an artist for whom the term ‘work in progress’ remains an astonishing understatement. Don’t prevaricate, investigate! For more information about this album visit www.pierceturner.com.